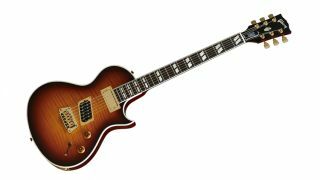 Gibson has announced the Nancy Wilson Nighthawk Standard in honour of the Heart guitarist. Nancy's Nighthawk features a figured Grade AAA, nitrocellulose finished maple top and commemorative 'Fanatic' truss rod cover, and is a bit of a looker if you ask us. The new signature has an MSRP of $2498 (that's approximately £1655). From the smash early success of 1975's Dreamboat Annie to contemporary hits launched by her much-applauded return to the band in more recent years, Heart guitarist Nancy Wilson has been the cornerstone of many of rock's most enduring songs, and the architect of a myriad timeless riffs. She has long been a fan of one of Gibson's more powerful "modern alternatives" too—and to recognize the union of artist and instrument, Gibson USA introduces the Nancy Wilson Nighthawk Standard, an elegant variation on a contemporary classic. The Nighthawk has been a favorite of a wide range of players since its introduction in 1993, thanks to its seamless blend of traditional Gibson quality with several clever modern design features. The Nancy Wilson Nighthawk Standard takes the format a major leap forward with a highly figured Grade-AAA maple top dressed in a high-gloss nitrocellulose Fireburst finish with Cherry back and neck, and a commemorative "Fanatic" truss-rod cover. It retains all the distinctive ingredients that made the Nighthawk stand out initially, including the 25 ½" scale length for firm lows and chiming highs, the comfortable body contours, through-body stringing and unique Nighthawk bridge, and the superb versatility of the pairing of Nighthawk Mini-humbucker and Nighthawk Lead humbucker, with five-way switching for a range of humbucking and single-coil combinations. Check out the Nancy Wilson Nighthawk Standard today at your authorized Gibson USA dealer, and experience this stylishly contemporary tone machine for yourself. The body of the Nancy Wilson Nighthawk Standard follows the Nighthawk's stylized take on Gibson's legendary Les Paul, with a deeper cutaway, a ribcage contour for enhanced playing comfort, and a longer scale length for a broader voice. Its top is made from figured Grade-AAA maple, and its back is solid mahogany. A solid, quarter-sawn mahogany neck with a 25 ½" scale length is glued into the body and carved in a comfortably rounded profile that measures 0.818" at the 1st fret and 0.963" at the 12th. The guitar has a bound fingerboard made from solid rosewood, inlaid with parallelogram position markers. A Corian™ nut cut on Gibson's computer-controlled PLEK helps to ensure optimum sustain and precise intonation. The heart of the Nancy Wilson Nighthawk Standard's superb resonance and sustain is found in its through-body stringing and rock-solid Nighthawk bridge. The bridge, strap buttons, and vintage-style "Gibson Deluxe" tuners are all gold plated, as are the pickup's mounting rings and neck pickup cover. Amber "top-hat" knobs lend an air of Gibson tradition, there's a commemorative truss-rod cover hot stamped with "Fanatic," and the guitar wears no pickguard to obscure the beauty of its highly figured top.